With veteran Billy Cannon coming up on his 11th season and backup Roger Hagberg having died tragically in an auto accident, the Raiders were in the market for a tight end. They took Chester in the first round of the 1970 NFL draft (24th overall), impressed with the speed he brought to the position. Cannon was let go, thus making room for the rookie in the starting lineup. Raiders went 8-4-2 to finish first in the AFC West while leading the NFL in total offense (4829 yards). Won AFC Divisional playoff over Miami Dolphins (21-14). Lost AFC Championship to Baltimore Colts (27-17). Chester went to the Pro Bowl after the 1971 and ’72 seasons, although his numbers were below those of his first year. But while his output was 62 catches over those two seasons, 15 of them went for touchdowns. 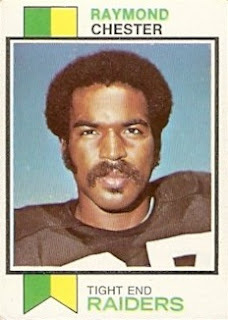 He was dealt to the Baltimore Colts for DE Bubba Smith in 1973 and, over the course of five seasons with them, caught 148 passes for 2122 yards and 11 TDs. Chester returned to the Raiders in 1978 and, in ’79, achieved NFL career highs in pass receptions (58) and yards (712) while earning a fourth Pro Bowl selection. His second stint with the Raiders came to an end in 1981, but in ’83 he played for the Oakland Invaders of the USFL and caught 68 passes for 951 yards and five TDs to earn All-League honors, after which he retired. For his 12-year NFL career, he had 364 pass receptions for 5013 yards (13.8 avg.) and 48 touchdowns.